I have no idea if this is something that has already been created out there, but I figured I’d do it anyway. 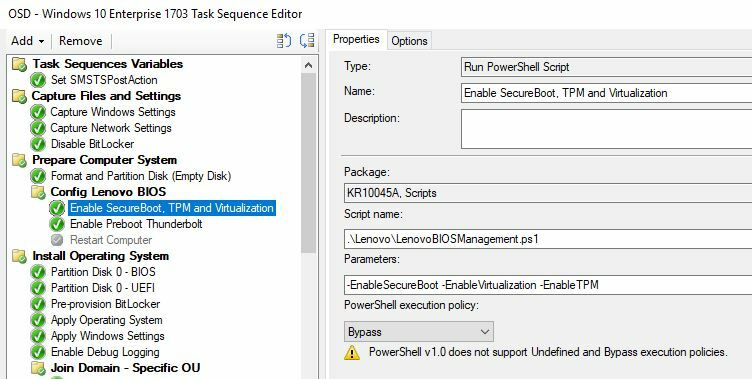 Mostly because Powershell, I need the practice and I needed the ability to easily modify the BIOS in our Lenovo environment. The script is inspired by the original VB script from Lenovo, which roughly does the same as my Powershell script. Lenovos script and documentation can be reached from this link (https://support.lenovo.com/dk/en/solutions/ht100612). However, it’s VB and it gives me shivers, so Powershell to the rescue. The script is still work in progress, as it doesn’t hold all the abilities as the original Lenovo script, but I prioritized the ability to turn on/off following: Virtualization, SecureBoot, PrebootUSB-C/Thunderbolt and TPM. An example from the use in my recent Windows 10 Task Sequence. The step is run prior to formatting the disk in WinPE. I have a condition on the step, to only run if a Lenovo laptop. Enable Preboot Thunderbolt is separated as a single step, as it’s currently only the most recent Lenovo laptops which has this ability: T470s, X1 Yoga 2nd generation etc., and therefore has a condition to only run if such model is being deployed. So, it’s that time of year; people heading back and forth on vacation and meanwhile their Active Directory password expires. People tend to miss the default notification popping up in Windows and have done so since forever. So how about getting an annoying email every day, 7 days prior to the actual expiration? The main goal here is to avoid having users ending up with expired password, and thus causing troubles for the user and generating calls to helpdesk. Write-Error "Active Directory module failed to Import. Terminating the script." 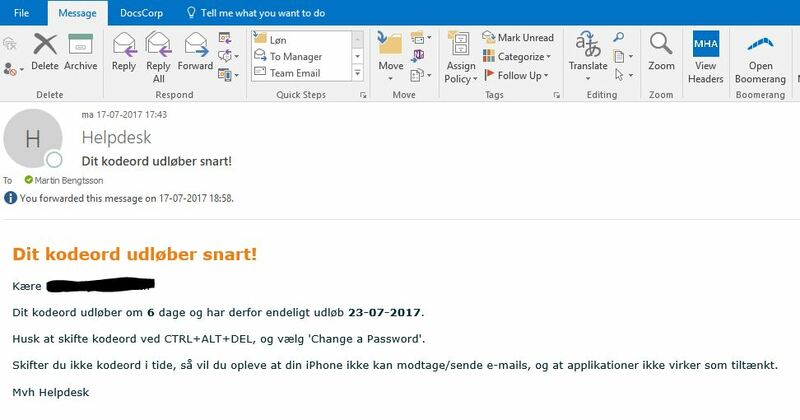 $Subject = "Password will expire soon!" Write-Host -ForegroundColor Cyan "$Name --- $To --- $ExpiryDate"
Preview of the email being sent. Also in danish because lazy. LAPS is Microsoft’s “Local Administrator Password Solution” and is a hot topic when talking about cyber security and what measures to take, when fighting the cyber criminals. Read more about LAPS here. This is just something short and sweet, and a very simple powershell script to monitor and read all computer objects in specified OUs in Active Directory, read the relevant attributes of the object, and if LAPS attributes are empty (hence no LAPS active), then list the objects in a list and send it as an email. You can run the script on a schedule using Task Scheduler, and this way monitor which computers in your Active Directory that’s missing LAPS. This scripts runs through all computer objects in specified OUs. If ms-Mcs-AdmPwdExpirationTime is empty, return to list and send email containing the list. Write-Error "Active Directory module failed to Import. Terminating the script. 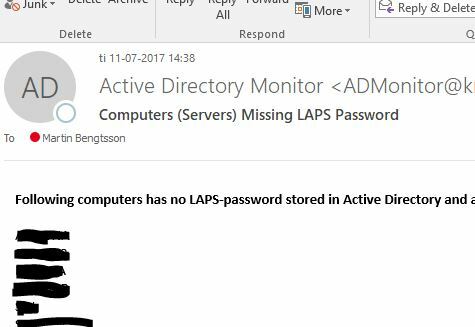 More details : $_"
$From = "Active Directory Monitor <SENDER@SENDER.COM>"
$Subject = "Computers (Servers) Missing LAPS Password"
$Body = "<b>Following computers has no LAPS-password stored in Active Directory and are therefore not protected by LAPS: (Count: $Count)</b><br>"
$Body = "No servers are missing LAPS - congratulation"
Write-Host -ForegroundColor Yellow "No servers are missing LAPS"
Managing our O365 licenses got me an idea to write one of my first Powershell scripts. The script is tailored to our environment, but can be altered to fit any needs without much hassle. The script looks for users in specified OUs and compare them to what users in O365 that are assigned a license. All users in the specified OU are being assigned the specified license. If a license is assigned to a user, who does not exist in the specified OUs, the license is automatically removed. This way I’m always on top of who is using our licenses. (#3) Reads what license you want to assign your users in the process. Change this to fit your needs and replace tenantname with your O365 tenant. (#4) Reads what conditions you have for filtering what O365 users that needs a license. I’m excluding my Office 365 Admin and a few others, as I don’t wanna mess with the license for those users. (#5) Reads the OUs containing user who needs a O365 license. You can specify several OUs if needed. (#6) Assign the location and license for each user found in OUs. You can filter additionally in this step if needed. (#7) Remove the O365 license, if user is not found in specified OUs. Change this to fit your needs and replace tenantname with your O365 tenant. #_2_Prompt for credentials used to log into O365. #_3_What license are we assigning the users. #_5_What OUs are we searching in. Write-Host "Setting location to DK for $($user.UserPrincipalName)"
Write-Host "Assigning $($O365License) license for $($user.UserPrincipalName)"
#_7_For each user assigned to an O365 license, check if user exist in OUs. If not, remove the license. Write-Host "Removing $($user.UserPrincipalName) from Office 365"
Set-MsolUserLicense -UserPrincipalName $($user.UserPrincipalName) -RemoveLicenses "tenantname:ENTERPRISEPACK"